The European Community (EC)-funded EMULATE (European and North Atlantic daily to MULtidecadal climATE variability) project began in November 2002 (contract EVK2.CT2002-00161). The project was lead by Prof. Phil Jones (Climate Research Unit, University of East Anglia) and included partners from the Hadley Centre (UK), University of Augsburg (Germany), University of Bern (Switzerland), Univeritat Rovira i Virgili (Spain), Stockholm University (Sweden), Goeteborg University (Sweden), Laboratoire des Sciences du Climat et de l'Environment (France). An initial aim of EMULATE was to define characteristic atmospheric circulation patterns over the European and North Atlantic region. Previous studies of this nature have been limited by a lack of gridded mean sea level pressure (MSLP) products of sufficient length. Central to EMULATE has, therefore, been the development of daily gridded MSLP data set, extending back to 1850; this data set is known as EMSLP. 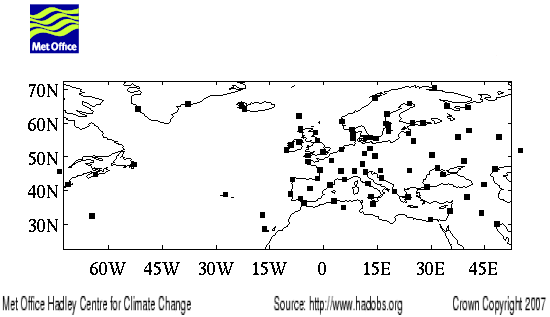 The EMSLP fields are a unique combination of 86 continental and island stations with marine pressure observations on a 5 degree latitude-longitude grid over the region 70 W - 50 E, 25 - 70 N from 1850 to 2003. Our strategy has been to take advantage of a Northern Hemisphere (north of 15 deg N) synoptic daily gridded MSLP product available from 1881 to the present (Jackson, 1986, hereafter referred to as J86), and to improve it while extending the analysis back to 1850 with the inclusion of new land and marine pressure observations. In all, 86 continental and island stations were selected (these can be downloaded from the project web site). The station observations were blended with marine observations from ICOADS. EMSLP pressures are reconstructed using a reduced-space optimal interpolation procedure, followed by superposition of quality-improved gridded observations onto the reconstructions to restore local detail. For a detailed description of the data set, including its limitations, and the production process, see the paper cited above. We recommended you read this before using the data. More details of the EMULATE project can be found at the project web site.